patients' skin - a known risk factor for SSIs.1 Sage's innovative rinse-free, alcohol-free formula is designed for early preop prep. It stays on the skin for maximum persistence. The cloth consistently delivers a uniform dose of CHG, unlike other soaps and solutions. 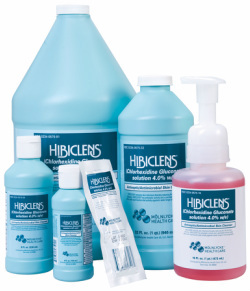 Hibiclens® the antimicrobial antiseptic skin cleanser can be an effective defense for preventing the spread of MRSA and other staph infections in your facilities. Its active ingredient, CHG works in a unique way- it kills germs on contact and bonds with the skin to keep killing microorganisms even after washing. reducing the risk of cross-infection. Cleansers only work if your patients use them. That’s why the StartClean cleansing program uses an individual patient reminder system to help you and your patients improve preoperative bathing compliance. Each kit includes one bottle of 4% CHG, three single-use sponges and a patient education template. Patients receive a text, email or voice mail reminding them to use their antiseptic cleanser prior to surgery.